"Believe me," he said, "I have seen the prince of darkness himself, for I propitiated him by sacrifices. I greeted him and spoke with him and his ancients; he liked me, praised my understanding, and before everyone said: 'Here is a new Jambres, always ready for obedience and worthy of communion with us!' And he promised to make me a prince after my departure from the body, and for the course of earthly life to help me in everything. And he gave me a legion of demons to serve me. When I departed from him, he addressed me with these words: 'Take courage, fervent Cyprian; arise and accompany me; let all the demonic ancients marvel at you.' Consequently, all of his princes also were attentive to me, seeing the honor shown to me. The outward appearance of the prince of darkness was like a flower. His head was crowned by a crown (not an actual, but a phantom one) made of gold and brilliant stones, as a result of which the whole space around him was illuminated; and his clothing was astonishing. When he would turn to one or the other side, that whole place would tremble; a multitude of evil spirits of various degrees stood obediently at his throne. I gave myself over entirely into his service at that time, obeying his every command." Thus did St. Cyprian relate of himself after his conversion. Then Cyprian called a yet more malicious demon and sent him to tempt Justina. He went and did much more than the first one, falling upon the maiden with great rage. But she armed herself with fervent prayer and laid upon herself yet a more powerful labor: she clothed herself in a hair shirt and mortified her flesh with abstinence and fasting, eating only bread and water. Having thus tamed the passions of her flesh, Justina conquered the devil and banished him with shame. And he, like the first one, returned to Cyprian without accomplishing anything. Justina replied that the reward for those who live in chastity is great and beyond words, and that it is very remarkable that people do not in the least concern themselves for such a great treasure as angelic purity. Then the devil, revealing his shamelessness, began with cunning words to tempt her, saying: "But then how could the world exist? How would people be born? After all, if Eve had preserved her purity, how would the human race have increased? In truth marriage is a good thing, being established by God Himself; the Sacred Scripture also praises it, saying: 'Let marriage be had in honor among all, and the bed undefiled' (Heb. 13:4). And many saints of God also did they not enter into marriage, which God gave them as a consolation, so that they might rejoice in their children and praise God?" Thus, having achieved nothing, the youth returned to Cyprian and told him of his woe. Seeing himself put to shame, Cyprian was greatly grieved and thought himself of going to Justina, trusting in the power of his sorcery. He turned himself into a woman and into a bird, but he did not manage to reach as far as the door of the house of Justina before his false appearances disappeared, and he returned with sorrow. 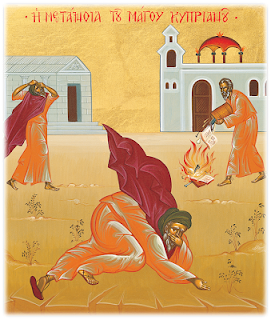 AFTER THIS CYPRIAN began to gain revenge for his shame, and by his sorcery he brought diverse misfortunes on the house of Justina and on the houses of all her relatives, neighbors and friends, as once the devil had done to righteous Job (Job 1:15-19, 2:7). He killed their animals, he struck down their slaves with plagues, and in this way he brought them to extreme grief. Finally, he struck with illness Justina herself, so that she lay in bed and her mother wept over her. Justina, however, comforted her mother with the words of the Prophet David: "I shall not die, but live, and I shall tell of the works of the Lord" (Psalm 117:17). 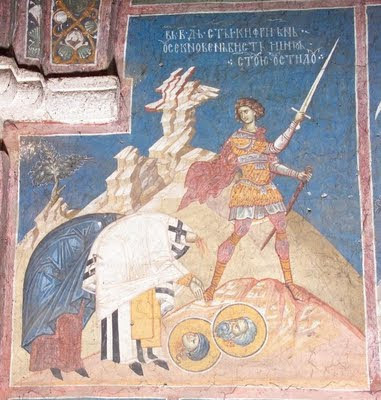 Having become convinced that nothing could conquer the power of the sign of the cross and the name of Christ, Cyprian came to his senses and said to the devil: "O destroyer and deceiver of all, source of every impurity and defilement! Now I have discovered your infirmity. For if you fear even the shadow of the cross and tremble at the name of Christ, then what will you do when Christ Himself comes to you? If you cannot conquer those who sign themselves with the sign of the cross, then whom will you tear away from the hands of Christ? Now I have understood what a non-entity you are; you are not even able to take revenge! Listening to you, I, the wretched one, have been deceived, and I believed your tricks. Depart from me, accursed one, depart! For I must entreat the Christians that they might have mercy on me. I must appeal to pious people, that they might deliver me from perdition and be concerned over my salvation. Depart, depart from me, lawless one, enemy of truth, adversary and hater of every good thing!" 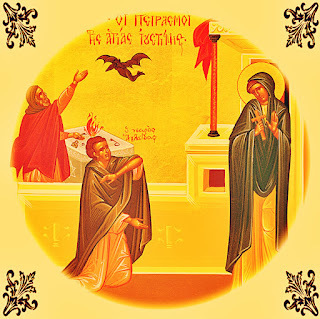 To this Cyprian replied: "As Christ my God liveth, Who has delivered me from the devil, Who has preserved the maiden Justina pure, and has had mercy on me—you will not chase me out of the church until I become a complete Christian." 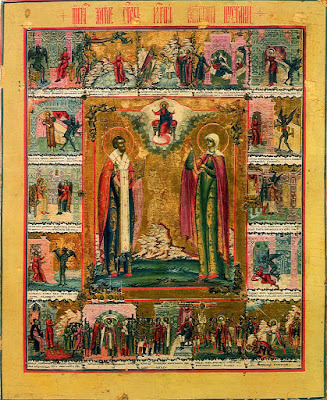 Seeing the strict life of St. Cyprian, his concern for the faith of Christ and for the salvation of human souls, the devil ground his teeth against him And inspired the pagans to slander him before the governor of the eastern region, saying that he had put the gods to shame, had converted many people away from them, and was glorifying Christ, Who was hostile to their gods. 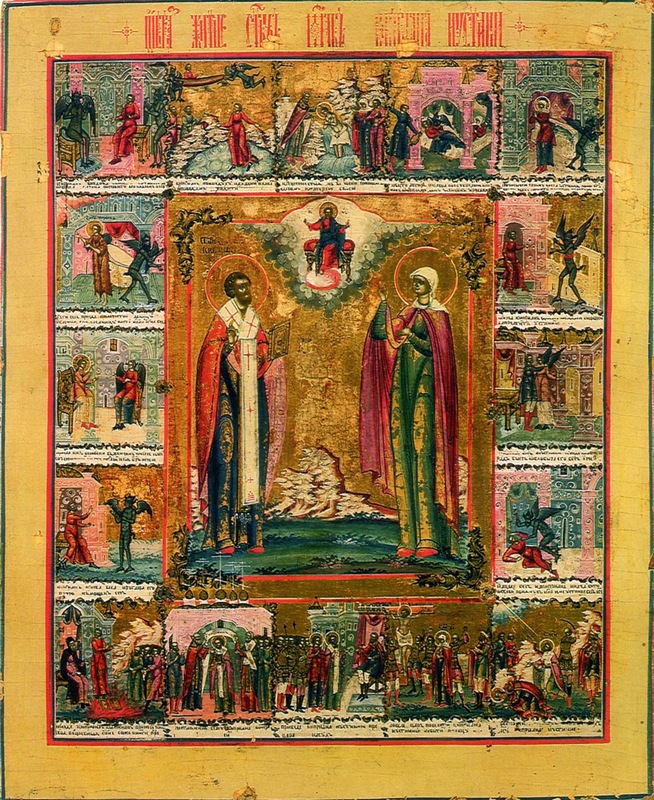 And so, many impious ones came to the governor Eutolmius, who was then governing those regions, and made slanders against Cyprian and Justina, accusing them of being hostile to their gods and to the emperor and to all authorities, saying that they were disturbing the people, deceiving them, and leading them in their footsteps, disposing them to worship the crucified Christ. At the same time they asked the governor to give Cyprian and Justina over to death for this. 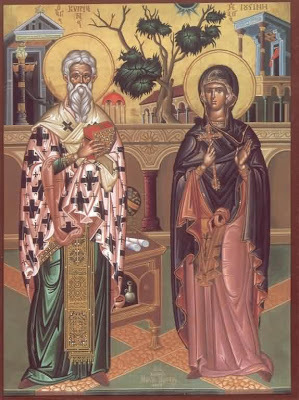 Having heard their request, Eutolmius commanded that Cyprian and Justina be seized and placed in prison. Then, setting out for Damascus, he took them with him in order to make judgment upon them. As a sharer of the ways and a successor to the throne of the Apostles, O inspired of God, thou foundest discipline to be a means of ascent to divine vision. Wherefore, having rightly divided the word of truth, thou didst also contest for the Faith even unto blood, O Hieromartyr Cyprian. Intercede with Christ our God that our souls be saved. When thou, O godly-minded one, hadst been converted from magic art to knowledge of God, thou becamest a most skillful healer for the whole world, O wise Cyprian, granting cures to them that honour thee with Justina; with her, pray the man-befriending Master to save us, thy servants who sing thy praise.